Damaged or worn windshield wipers can cause poor visibility in extreme weather which is a significant factor in many accidents. That is why most most experts recommend changing them about every 6-9 months. The good news is you don’t have to spend a lot of money to get good performance, generally a new wiper blade will cost between $8 and $20 each for an 18″ model and slightly more for a longer version. We recommend shopping on Amazon because not only do they have the best prices we could find, but you can also see if the item will fit on your car by just selecting the year, make, and model. There are two main styles of wipers – conventional models with brackets and the newer beam blades, or bracketless, which use spring steel in the rubber to apply more even pressure and have no external frame. The newer beam blades are preferred for winter conditions since there is no bracket for ice and snow to build up around. If winter weather is not a factor for you, then models with or without a bracket will work just fine. You can also use a windshield treatment like Rain-X to get more life out of windshield wipers. You may find that certain models work really well with one car and not with another. This is usually due to the curvature of the windshield. Sometimes you may have to buy a few different models before you find one that works really good on your particular vehicle. We reviewed the best windshield wiper blades to come up with our top 5 below. We also have a comparison chart at the bottom of this article to easily compare one model versus another. 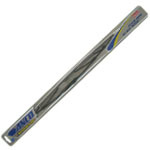 If you are looking for the best wiper blade then look no further than the Bosch Icon, which sells for about $19. It is the highest rated model on Amazon and is also one the best sellers. The Bosch Icon beam blade design applies even pressure across the entire length of the blade for superior all-season performance no matter the curve of your windshield. It is also up to 40% longer lasting than other top tier blades thanks to its exclusive fx dual rubber that resists deterioration. It is the most expensive wiper blade on our list, but the Bosch Icon Wiper Blade is longer lasting and performs better than any other model listed no matter the weather conditions. Buyers should be aware that for each size Bosch may also have an A or B designation. The type A is for driver or passenger side, while the type B has a slight extra curve for the passenger side only. You can combine them in A/A or A/B combos. The best-selling wiper blade on Amazon is the Rain-X Latitude 2-in-1 Water Repellent Wiper Blade which sells for about $14.51 for an 18-inch blade. This model uses a beam blade design made from premium graphite-coated, blended synthetic rubber. It will work well in all weather conditions including icy and snowy. What makes this windshield wiper blade stand out is the Rain-X water repelling coating that transfers from the wiper squeegee to the windshield during initial use. To transfer the water repellency you must install the blades and turn them on and wipe dry at the medium speed for 2 to 3 minutes. Then spray washer fluid briefly and the water repellency is activated. We prefer the Bosch Icon slightly over this Rain-X product mainly because it lasts longer, but the performance difference is very slight and you can save a bit of money by buying the Rain-X Latitude 2-in-1 Water Repellent Wiper Blade. 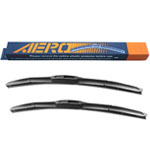 The AERO Hybrid Premium Quality All-Season Windshield Wiper Blades are unique in that they are sold in packs of two for the exact pair of wiper blades you need for your automobile. Before you buy you need to make sure that both blades are the correct length for your car or pick a different product that has both. A pack of an 18-inch blade and 22-inch blade sells for about $19. This AERO model uses a hybrid design of a more conventional blade with an outer covering which makes them work better in winter since there is no exposed bracket for ice or snow to accumulate around. Overall the AERO Hybrid Premium Quality All-Season Windshield Wiper Blades will work in any weather, but it does not quite perform as well as the premium pure beam blades. One of the cheaper wiper blades to make our list is the ANCO AeroVantage Wiper Blade which sells for just over $10 for the 18 inch version. Despite that cheap price this model actually scored a solid 4.0 rating on Amazon from users. The AeroVantage blade uses a traditional conventional blade with an aerodynamic design for better performance at high speeds. We would recommend the ANCO AeroVantage model for users who do a lot of freeway travel at high speeds in areas without a lot of winter weather. The cheapest wiper blade to make our list is the Rain-X Weatherbeater Wiper Blade which sells for $9.78 for an 18-inch long version. This is Rain-X’s conventional blade and does not include the Rain-X water repellent built into the blade. 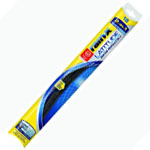 These windshield wiper blades tend to work really well when first installed, but the performance degrades with age. So don’t expect to get a long lifespan out of them. 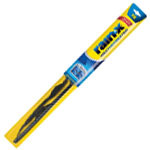 Overall we recommend the Rain-X Weatherbeater Wiper Blade for anyone looking for a solid, cheap wiper blade. However, if you live in an area with a lot of snow or ice you should probably consider a beam blade instead.